Do you have a prescription and would like to support the FBM initiative? Ask your doctor if an FBM product is suitable for you. Ask your pharmacist if they have an FBM product in stock. You may need to call your local pharmacy prior to your visit. If they do not have FBM products in stock, ask them to order it in. For your first prescription your pharmacy may take a day or so to get this product in. 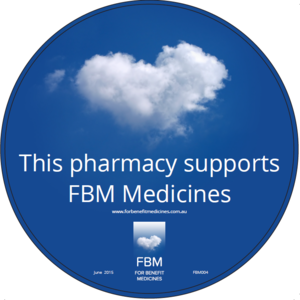 Pharmacies that stock FBM products may also have the cloud sticker on their window. mailto:product.enquiry@fbmedicines.com.au. Be sure to tell your friends about the FBM concept, and to visit our website frequently for updates.